The Minnesota Wild have signed defenseman Jonas Brodin to a six year contract extension, the team announced Sunday morning. This means the 21-year-old Swede is set to play through the 2020-21 season with Minnesota. Brodin has played for Minnesota since he was 19 and has become an integral member of the team since joining in 2012. 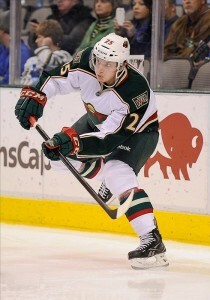 The blue-liner has played 126 games for the Wild in two seasons, acquiring 31 points in that span. To add to that, Brodin has already posted an assist and a plus-5 rating in the first two games this year. “We are very excited to get Jonas Brodin signed through the 2020-21 season. He is one of the premier young defensemen in the NHL and has played a huge role on our team since entering the league as a 19-year-old,” Chuck Fletcher said in a statement released by Wild.com this morning. After signing Darcy Kuemper and Nino Niederreiter to extensions this offseason, it’s clear the the Minnesota Wild know which players it needs to invest in. These young players like Kuemper, Granlund, and Brodin are the future of the team. Now that the Wild has taken care of Kuemper, Niederrieter, and Brodin for at least the next couple of seasons, this leaves Wild GM Chuck Fletcher with the task of resigning Mikael Granlund, Erik Haula, Marco Scandella, and Charlie Coyle, who will all become restricted free agents after this season. This seems like a large task, but Fletcher looks like he knows what he’s doing. I firmly believe this group of players has the talent to take Minnesota far into the postseason and make the team a legitimate contender for the Stanley up. I think Fletcher knows this, as well, because he’s making the effort to keep these young guys around for an extended period of time. It’s pretty easy to see that this core group of young and talented players like Kuemper, Brodin, Granlund, etc, are the pillars that the future of this team is going to be built on.